SAN DIEGO (NNS) — The assistant secretary of the Navy for Manpower and Reserve Affairs sponsored the third annual Wounded Warrior Hiring and Support Conference, Oct. 29-30. The event was co-hosted by the Space and Naval Warfare Systems Command (SPAWAR), Naval Sea Systems Command (NAVSEA) and Naval Air Systems Command. The two-day conference was a combined effort to promote education and training, career development and long-term employment and support for wounded, ill and injured service members and disabled veterans. The theme of this year’s conference was “Hiring our Nation’s Heroes – Rise to the Challenge. Diversify your Workforce!” The conference brought together government, military and industry leaders, hiring managers and recruiters from more than 50 organizations. Though several of the conference’s speakers were unable to attend due to severe storms on the East Coast, the mood was positive and the message clear: hiring wounded warriors adds value to any organization. Brian Persons, NAVSEA’s executive director, said having the three big Navy systems commands at the event was significant because combined the organizations are a centroid of opportunity for wounded warriors looking for employment. He also acknowledged the difficulty many veterans face maneuvering the bureaucratic hiring system. Workshops and panels were available to those looking for work and covered a wide range of topics, including understanding military wounded warrior programs, career assessment and goal setting to starting your own business, maneuvering the federal hiring process and apprenticeships, internships and training. About three million veterans reported having a service-connected disability, which compounds the difficulty for many veterans looking for work. However, the good news according to the U.S. Bureau of Labor Statistics is that the jobless rate for all veterans has fallen from 8.3 percent in August 2011 to 6.6 percent now, which is the lowest rate in more than three years and below the national unemployment rate of 8.1 percent. The unemployment rate for Iraq and Afghanistan-era veterans is still hovering around 10.9 percent. Despite the higher unemployment figures for the nation’s Gulf War II-era veterans, the Navy’s goal of raising awareness and increasing the hiring of wounded warriors is having an impact. Hernandez was discharged from the Marine Corps and received the Naval Achievement Medal with a Combat “V” for valor for his service. He is currently a contract specialist with the Naval Health Research Center at Naval Base Point Loma, Calif.
For many wounded, ill and injured service members and disabled veterans, finding viable employment is a challenge. The Department of Navy (DoN) established the Wounded Warrior Hiring and Support Initiative to help coordinate wounded warrior employment efforts and ensure wounded warriors have access to available education, training and employment opportunities and resources. Since last year’s conference, the DoN has hired 9,478 veterans, including 1,647 returning service members with a 30 percent or higher disability rating. The Wounded Warrior Hiring and Support Conference is now in its third year. The purpose of the conference is to bring together government, military and industry leaders in a venue to raise awareness about hiring and supporting wounded warriors in the workplace. Leaders and organizations provide recommendations and strategies to successfully transition veterans into their workforce, including hiring, training, development and retention. It is a forum to promote career development, long-term employment, education and training for the nation’s heroes. 10/25/2012 – WASHINGTON (AFNS) — The Air Force’s only female four-star general used examples from her three-decade-plus career to show the tremendous progress of women in the military during a gala dinner celebrating the 15th anniversary of the Women in Military Service for America Memorial Foundation in Washington, D.C.
Gen. Janet C. Wolfenbarger, Air Force Materiel Command commander, was the keynote speaker for the dinner celebrating the more than two million women who have served in the military. Wolfenbarger was among the first group of women to graduate from the U.S. Air Force Academy, in 1980, and told the audience of former and current military women that there was a great fear in the beginning that standards would somehow be lowered by allowing women to attend the service academies. “So, I, along with my female classmates, spent four years proving that the standards, in fact, would not have to be lowered, and that women could not only survive, but actually thrive in that very challenging environment,” said Wolfenbarger. But as much as a trailblazer as she’s been, Wolfenbarger has wanted to be recognized, not for her accomplishments as a woman, but for simply working hard and accomplishing the mission. She went on to tell the audience of more than 300 about assignments that took her to the top levels of Air Force acquisition, both at the Pentagon and later at the Air Force Materiel Command where served as the vice commander for close to two years, before taking the role in the Pentagon as the military deputy to the assistant secretary of the Air Force for acquisition. Thanking the audience for their service, some dating back to World War II, Wolfenbarger said that while women have doubled their ranks in the Air Force, there’s still room for improvement. The Navy will christen its newest attack submarine Minnesota, Saturday, Oct. 27, during a 10 a.m. EDT ceremony at Newport News Shipbuilding, a division of Huntington Ingalls Industries, in Newport News, Va.
Minnesota, the 10th ship of the Virginia class is named in honor of the state’s citizens and their continued support to our nation’s military. Minnesota has a long tradition of honoring its veterans of wars past and present. The state is proud to be home to 46 Medal of Honor recipients that span from the Civil War to the Vietnam War. This will be the third ship to bear the state name. The first USS Minnesota, a sailing steam frigate, was commissioned in 1857 and served during the Civil War, remaining in service until her decommissioning in 1898. The second Minnesota was commissioned in 1907. On Dec. 16, 1907, she departed Hampton Roads as one of the 16 battleships of the Great White Fleet sent by then-President Theodore Roosevelt on a voyage around the world. She continued her service through World War I, and was decommissioned in 1921. Minnesota will provide the Navy with the capabilities required to maintain the nation’s undersea supremacy well into the 21st century. She will have improved stealth, sophisticated surveillance capabilities and special warfare enhancements that will enable her to meet the Navy’s multi-mission requirements. Designated SSN 783, Minnesota is built to excel in anti-submarine warfare; anti-ship warfare; strike warfare; special operations; intelligence, surveillance, and reconnaissance; irregular warfare; and mine warfare missions. Capable of operating in both the world’s shallow littoral regions and deep waters, Minnesota will directly enable five of the six Navy maritime strategy core capabilities – sea control, power projection, forward presence, maritime security, and deterrence. 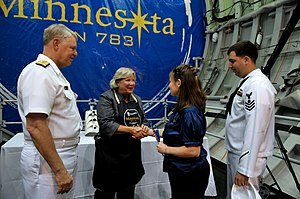 The 7,800-ton Minnesota is built under a teaming arrangement between General Dynamics Electric Boat and Huntington Ingalls Industries. A crew of approximately 134 officers and enlisted personnel will operate the 377-foot long, 34-foot beam vessel, which will be able to dive to depths of greater than 800 feet and operate at speeds in excess of 25 knots submerged. Minnesota is designed with a nuclear reactor plant that will not require refueling during the planned life of the ship – reducing lifecycle costs while increasing underway time.